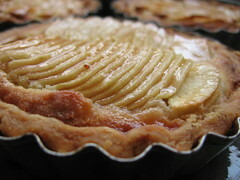 Apple Frangipane Tartlets - Do You Know The Muffin Man? Notes: With some of the leftover baked shells from the quince tartlets, and some leftover frangipane made in class on Saturday, I improvised some additional tartlets. I filled the baked shells with frangipane, then topped them with thinly sliced Northern Spy apples, then sprinkled some granulated sugar on top. After baking them in the oven until the frangipane was browned, I brushed some quince poaching liquid to keep the apples moist. 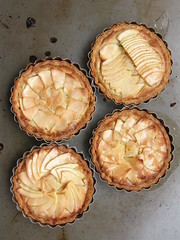 These weren't the tastiest tarts, as the shells got a bit too brown from being double-baked, and the apples became dry and a little chewy.